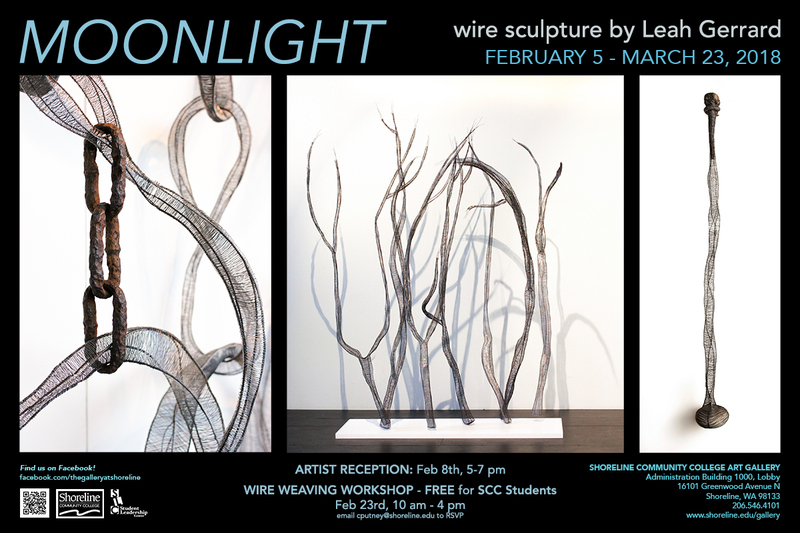 Metal sculptor Leah Gerrard has an exhibition at the Shoreline Community College Art Gallery from February 5th through March 23rd. Gallery Hours: Monday - Friday, 9am - 5pm. The Artist Reception will be Thursday February 8th, from 5 - 7pm, Shoreline Community College Art Gallery 16101 Greenwood Ave N, Shoreline 98133, Building 1000 Lobby. Free parking after 4pm. Meet the artist, mingle with friends, enjoy light refreshments! Leah Gerrard has worked with metal for twenty years. Her passion for wire was sparked by a jewelry class in Italy, and led her to explore sculpture at Linfield College. Inspired by a fellow student's intricate beaded wire baskets, Leah started weaving her own. After making a few beaded baskets, she found that it was the simple skeletal structure of wire that interested her. Self-taught, she experimented with various wires and different weaving techniques. Leah continues to develop her methods, expanding into large-scale sculpture entwined with found objects. Her process continually evolves in response to challenges created through her designs.